today, a Chevy Malibu costs $22,000. today, microwaves can be had for less than $50. today, consumer-bought hard drives cost $0.01 per 300 megabytes. See the huge cylinder that guy’s pointing at? That’s what 3.5MB looked like fifty years ago. Modern $5 thumb drives are 1/2000 that size and hold 2000-times more information. 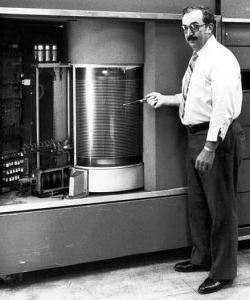 Imagine what a terabyte will look like in a decade. This entry was posted in Taiwan Writings and tagged advancement, advancements, bel air, change, chevy, computers, computing, cost, first hard disc, first hard drive, ford, future, gigabyte, hard disk, hard drive, hdd, history, megabyte, microwave, model t, technology, terabyte.